Early Saturday morning (after a night of intense wine drinking), I stumbled out of the bed wishing I had the foresight to cancel on Friday afternoon. After a quick run to Shipley’s donuts ( breakfast of the champions), I was ready to ball (or drive) on my opponents. I was ready to play! I got dressed in my nice khakis and my husband’s official looking golf jacket (it was dreary and cold). 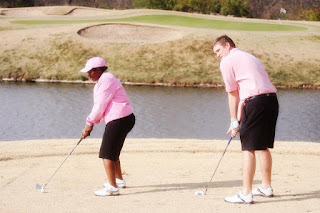 I got to the golf course with my husband/caddy ready to dominate. Then I received the devastating (ahemm, awesome) news. Five contestants canceled and one individual was a no show. I am the only one who showed up! Really? Was it dedication or madness? I showed up and therefore was victorious over those who did not. I take my victories where I can find them, and I was particularly thankful for this one.